After a rainy Winter and Spring, the weather is great here in southern California right now. It’s time to switch things up for a new look. 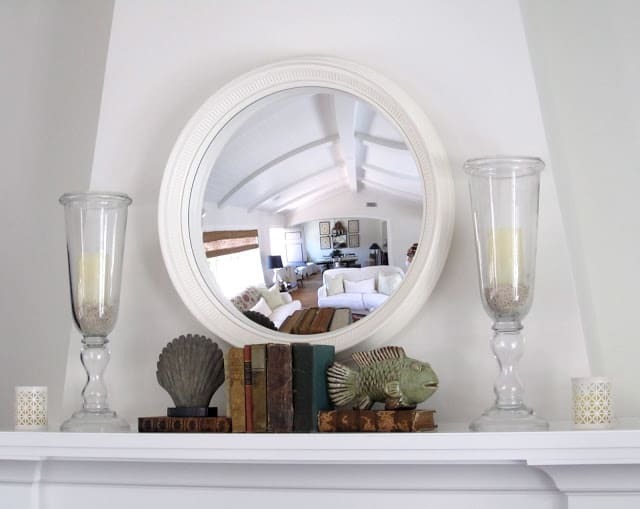 The white convex mirror is a new purchase from Juxtaposition. Read more about our local store on La Dolfina’s post. John Roselli’s) came from Home Goods. 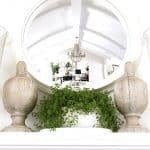 You could even paint an existing mirror frame white for a lighter look. 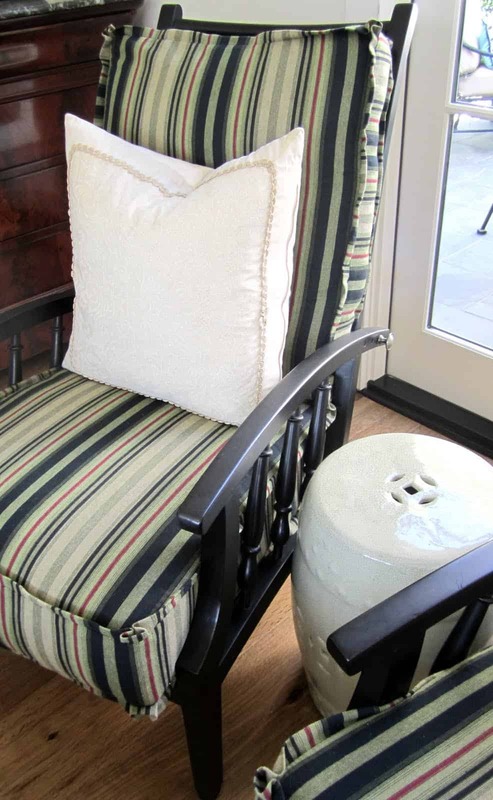 Add crisp linen and cotton fabrics (I am storing the “winter” pillows). by moving them to new places. 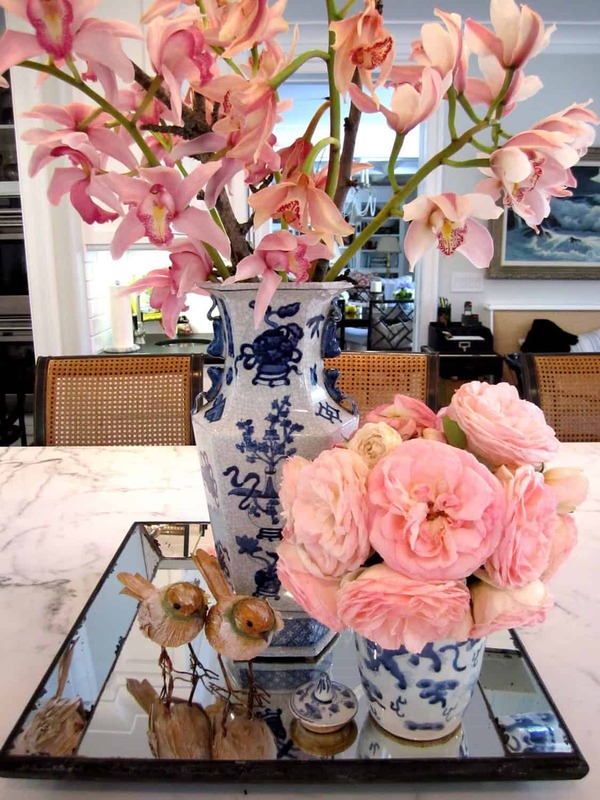 And fresh flowers are always a good idea! Participating in Summer May’d Ideas for Summer Party. Mary Ann! Your house is gorgeous! I love it and want to move in with you, if that's okay, just me and my husband, three kids and dog. Thanks. I feel like we're shopping at the same Homegoods because I JUST saw that mirrored tray yesterday – is it from there? That is so weird – you're all the way across the country from me!! I had it in my hand and had to force myself to put it back because a tray is not on my list have "needs" – so I'm so glad you have it! 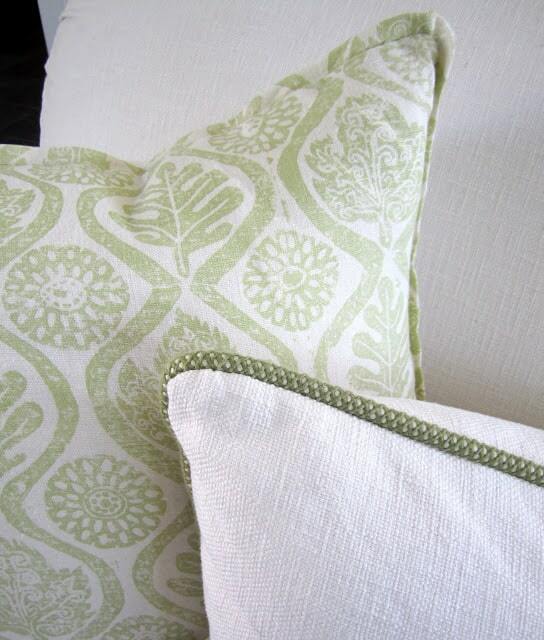 Love all the white and fresh fabrics in your house right now…..so bright and cheerful. Oh happy spring! Great tips! Love the convex mirror! 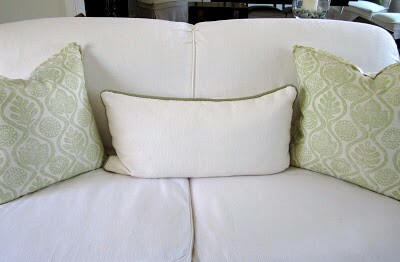 I have been washing slipcovers for the past three days:) I have alot. My two youngest " christened " the freshly laundered ll essay cover with a walk by popsicle wipe and a chocolate milk drip:) they keep me busy. As my mother always says, it's a good thing they're cute! " sometimes not cute enough, ha. All great tips, Mary Ann. I love that you moved things around and changed your pillows to "summery" ones. The mirror is beautiful. Love it all! Our weather on the East Coast is breaking too…it's wonderful! Excellent suggestions 🙂 lightness & simplicity for summer (and less to clean). As always, your home is stunning ~ thanks for sharing! 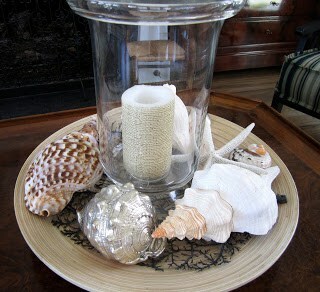 I love the sea shell arrangement – such a lovely touch! This is a beautiful post. 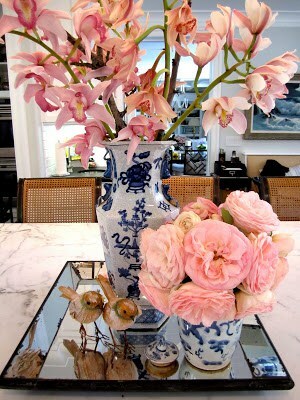 I love fresh cut flowers everywhere, and I exchange winter and summer pillows and accessories too! YES! The sun is out and the skies are blue and I have done the same lightening up in my home! Juxtaposition Home is one of my favorite stores … love going in and just walking around seeing all their fun things (pillows especially!). Your new mirror is fab. Ahhhh, what a wonderful refreshing post! There is nothing like squeaky clean to lift your spirits! Thanks for sharing it and thank you for the mention!!! Your house certainly looks beautiful and summery! I love all you did, specially your mantel. I adore changing around my own stuff, without having to buy things and also finding old things in boxes, as I just did! Thanks for coming by and for the lovely comments. These are perfect decorations for summer! Love them all! Mary Ann, great suggestions and I still need to do the windows. Love your summer mantel. I adore your hand towel holder! Great tips! I need to get outside and wash my windows. I'm always amazed at how much more light comes into the house when I've done them. Your mantel looks terrific! Thanks for sharing. Love your tips and your mantel looks beautiful! I always seem to put off getting the windows washed and then when I do, I can't believe what a difference it makes! 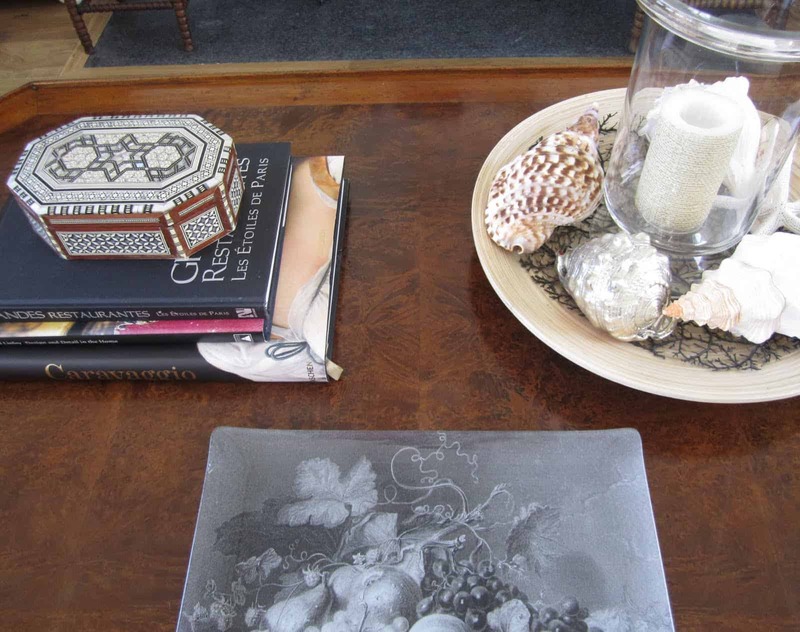 The mirrored tray is actually my friend, Debbie's and it IS from Home Goods (I want one, too). Your home is so beautiful! Just stunning……I love all the new improvements. Great and helpful practical tips that everyone can apply to every day living…….love your green and white pillows, they are so fresh and crisp looking! And your fresh flowers in the blue and white, a special love of mine!! Great ideas here for de~cluttering and making your home ready for summer! Lighter and breezier! And your home certainly reflects this. How beautiful, Mary Ann! I found it therapeutic to wash my windows! It was like washing the gray of winter away. 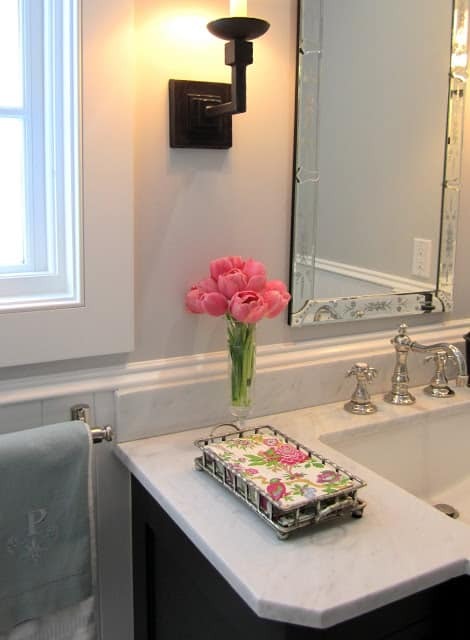 Love that image of the pink flowers in the bathroom. I can't wait to freshen up our powder room! I love your attitude on freshening things up without buying all new. Your home looks so pretty for the summer months, you even found summery guest towels! Great tips. Proof that you don't always need to do a whole lot or spend a lot of money to make an impact. Pretty post! I feel lighter and brighter just reading it. Makes me ready to freshen things up around here! just lovely! i just put away my "winter" pillows too. Your house is so inviting and beautiful! Very inspiring! Really well done. I just love it! Mary Ann it all looks so beautiful…love the crisp, light inviting feel…gorgeous!! 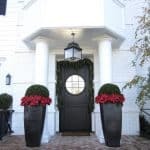 Mary Ann, thank you for commenting on my blog, I have enjoyed looking at the pictures of your house, lovely! Lovely post. Spring cleaning, clearing, storing and reorganizing is so refreshing and once completed I've always felt that my home smiles back at me. I make my lists and work the magic of transition. This year it includes painting, adding additional shelves in closets etc. The energy in you home lifts and you are open for more good things to happen. 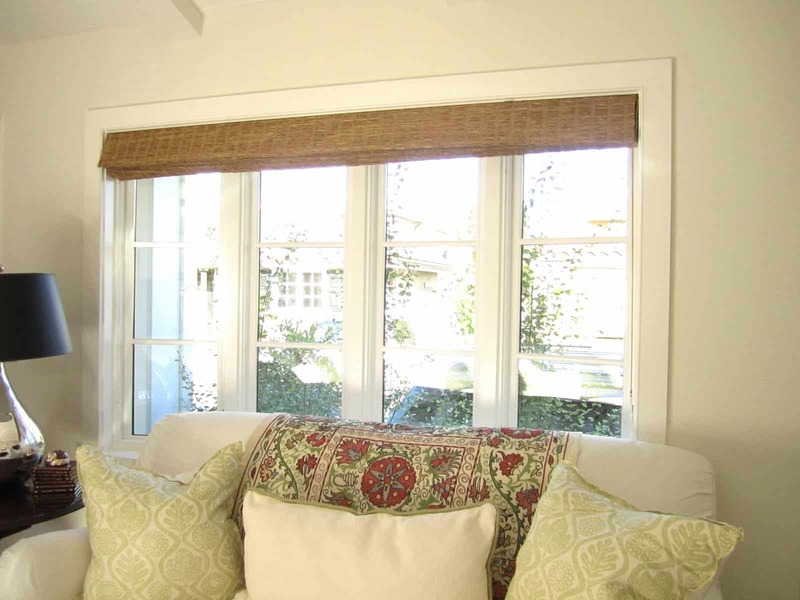 What a gorgeous light & bright transformation! love it!! Letting the sun inside by washing the windows is the best tip however, I love them all! Thanks for sharing. Hugs! Hello summer house! 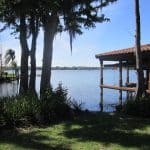 Your place is gorgeous, thanks for sharing! I love how you lightened up your home for the summer and you're so right, it doesn't have to cost a fortune. Sometimes the indgredients are right there in your home. I'd love to have you link your post to Seasonal Sundays this Sunday. I appreciate your comment on my post about the tea pots we used as decortions for our Royal Wedding Breakfast. Do stop back to see the post on the breakfast itself. Great ideas! 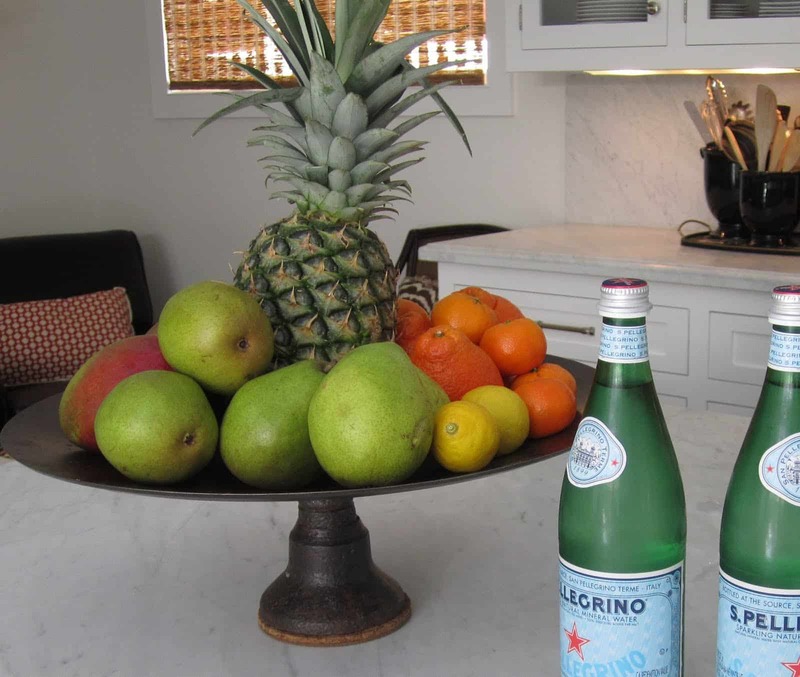 I love the ideas of changing things up, rearranging and displaying summer fruits and flowers! I also like to switch out my pillow cases, and my weekend project is window washing! Thanks for sharing great tips! You have a lovely home. 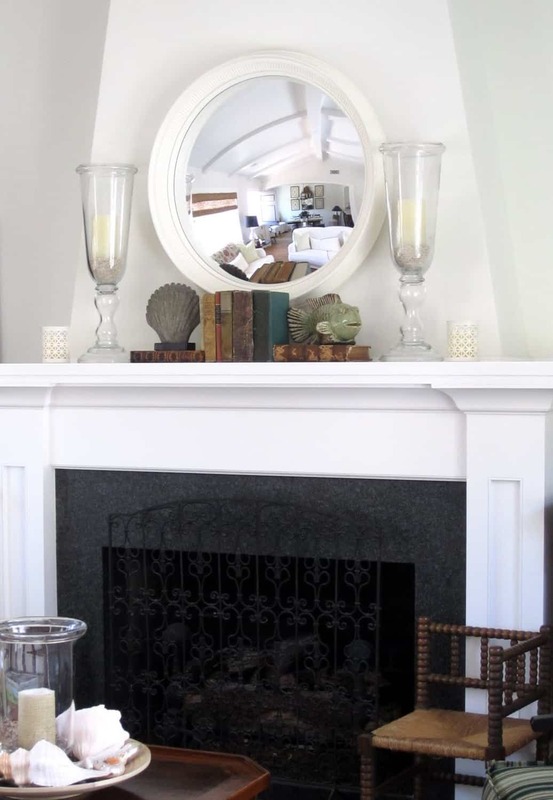 The white mirror looks great on your mantle. Thanks for adding your link to Beach Cottage Good Life Wednesdays! It really is the simple things that can make all the difference! What a beautiful home you have! I love that fresh and "summery" look. The idea of changing pillows is excellent and it works! great,inexpensive, easy tips! your home looks lovely! i really like the mismatched book ends… adds such character! I'm just dropping by to wish you a very Happy Mother's day to you! Mary Ann, Everything is so beautiful and I love the mantel display. 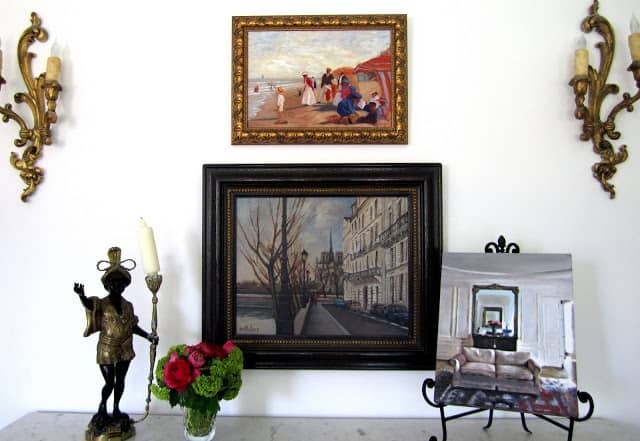 Did you get my email about featuring your home? I would love to have you join my linky party, too. Just click the link at the top of the page to join. What great tips! This is exactly what I am doing right now, and it feel so wonderful!!! Your home looks absolutely beautiful! I think that I recognize a family friend in your Parisian group photo. 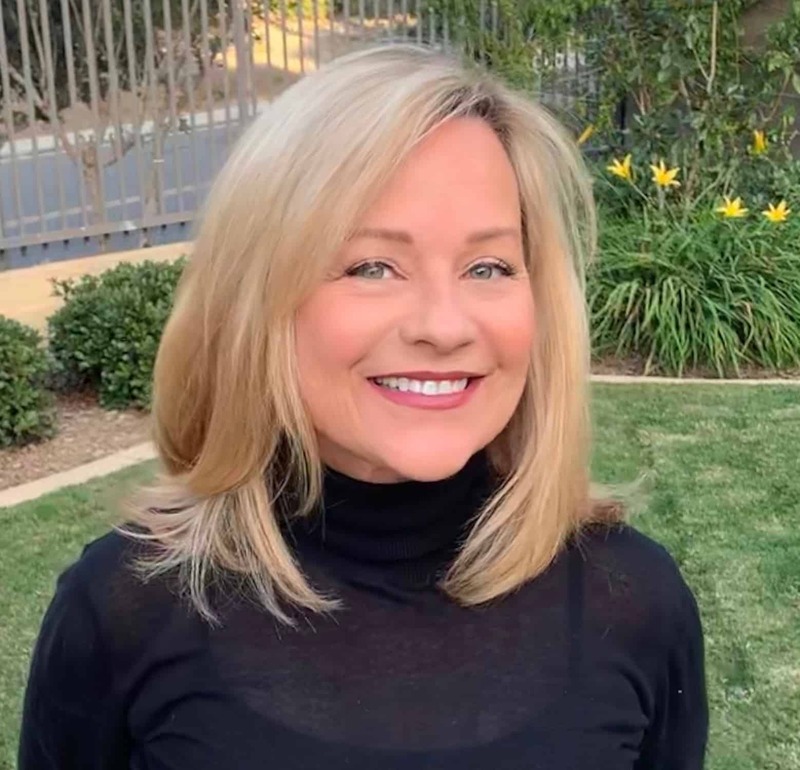 Could it be Janeen, the artist of KOCO? I'm so sorry I missed your mantel!! 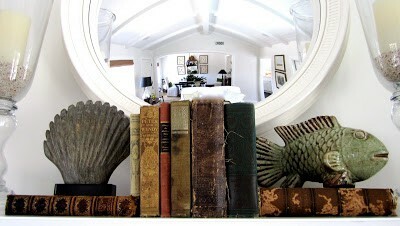 Love the antique books and the bookends of course!! your house is just gorgeous – i love it so much!!!!! you are so lucky to live in such a beuatiful place. really, really pretty!! !